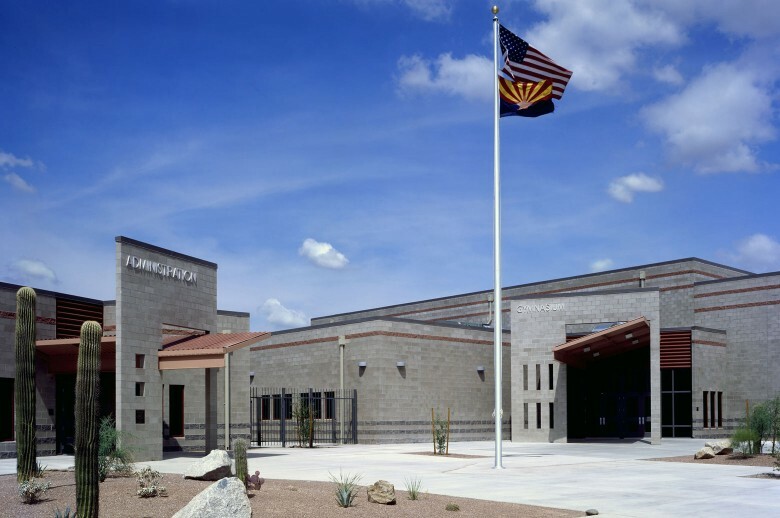 This secondary education facility, designed to accommodate 750 grade 9-12 students, is the first school in Arizona to function in a fully wireless data environment. Every student at the school is issued a laptop computer. Students, from any place on campus, can access all of their educational materials, such as homework, class notes, and textbooks, through their laptop. This change in educational strategy has influenced the design of the school. Space that would normally be devoted to computer labs and textbook storage is dedicated to additional teaching areas and flexible indoor/outdoor study areas. Thus the campus buildings are all arranged around several courtyards of varying sizes to facilitate interactions between people and promote the atmosphere of a unique, tight-knit community. This entry was posted on June 19, 2013 by swaim_admin.